What I learned while waiting. It was a year ago today that my Grandpa passed away. I haven’t seen him whole and real since last August, so though it was only a year ago that he was here and then not, it feels like longer. He wasn’t himself for all those months that he was sick. And what I miss is his Self. His laughing, smiling, slow-driving, made-up-language-speaking Self. My dad drives Grandpa’s truck now, which is strange and practical and disorienting. Since I don’t live at home anymore, every time I come home on break, I see the truck in the driveway, the truck that picked me up from band camp and brought me to middle-of-day doctor’s appointments. For a second, I think I’ll see him behind the wheel. It’s funny; my sister says sometimes she sees Dad driving it and he looks vaguely like Grandpa, hunched up behind the wheel. My dad has been doing Grandpa-y things lately. I like it. We had my Grandpa’s memorial in July this year. I read the piece I wrote last year after he died – it was so much fun to tell that story of him again. I’m glad I got to do it, but to be honest, I wasn’t entirely excited about waiting until July to have his memorial. I remember being upset about the waiting, upset that we weren’t going to end what felt like months of stress and grief and busy-ness at the time when they should end. (Something I’ve noticed about myself is that I often feel like the shoulds of my life need to be the same as the shoulds in everyone else’s. If something should happen a certain way for me, it should happen that way for everyone else. In the end, it was good to wait to have the memorial, for practical reasons and for symbolic ones. Practically, considering last winter, it was easier for everyone to get up the hill to the cemetery where we buried his ashes when there wasn’t three feet of snow on the ground. Symbolically, it was beautiful, because summer personified my grandpa. He was all sunshine and darkened skin and tattered summer tank tops. He was more lawn mower than snow plow, more light breeze than stinging chill. And the wait itself was good for us. It gave people time to patch up a bit. For months, life had been hospitals and doctor’s visits and stark white walls and trips to Cleveland and where is the joy I thought this was Christmas? It had taken three months for my grandparents to go from being well to one of them being sick enough for Hospice. There needed to be time before putting a definitive end to all that. I learned a lot about waiting last year, but I’ve only just begun to really think about it this year, during this Advent. Advent is about waiting – it is about joyful, patient, hope-filled waiting for the King, for the Immanuel. Last year, I didn’t care much for Advent waiting. The defiant optimism of Christmas, while in many ways welcome, comforting, peaceful, was also full of hurt and stress. I don’t know how others in my family felt about it, but for me, it was like putting Neosporin on a fresh cut: It was meant to help. It was meant to heal. But all it did then was sting. This year, I have been stoked for Christmas. I have loved Advent, loved re-learning how to wait with joy. Last year, I was waiting for death. And while I tried desperately last year to focus my attentions on the hope that Jesus brought, the sheer wonder and brilliance of God-with-us – I couldn’t unstick my mind from the waiting for something I dreaded happening. It was hard for me to really understand what God had begun to try to teach me, ever so gently, so lovingly, as He does. This year, I’m beginning to see it. 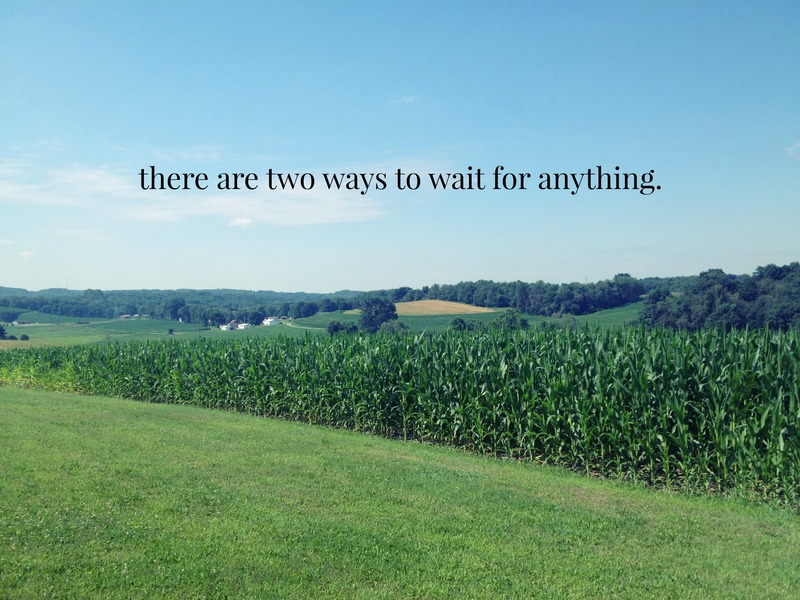 There are two ways to wait for anything. We can wait with hope or with dread. And maybe sometimes it’s both, because life is full of bad things – but life is more full of good things, of beautiful and awesome and magnificent things. Jesus came here. He didn’t come as a pig for slaughter; he came to show us a life well-lived. A Full Human Life – that’s what we were waiting for. And that Human Life led to death, but not forever-death. There is no greater love than the love that lowers it’s head to the guillotine, that jumps in front of the gun, that crawls up on the altar itself, that gives up his life for his friends. That life was one spent loving the poor and the forgotten, raising up the oppressed, lifting the beggars and adulterers and lepers up from the dusty path and calling them blessed, wanted, chosen, remembered, precious. When we wait in Advent, we are waiting again for that Full Human Life, that life that saved us by dying and returning, that life that promised us that we would wait with dread no longer. Wait with dread no longer. Even for the bad things. Even when we are waiting for death, what we are really awaiting is new life, Full Human Life. We are awaiting a day when the people we love, and someday we ourselves, can step out of these shadows and figure out what it’s really like to live in the Light. So, yes, today I am sad. Today, I miss my Grandpa a lot. But what I want, what I desperately want, is to remember how to wait with hope. To be sunshine and darkened skin and tattered summer tank tops in the midst of winter. To give myself and others time to heal. To anticipate the beautiful, the King, the Immanuel. May my Advents be ones of hope. Big life to be had. And for a few hours, I was really proud of those words. My conversation partner had noticed them too, writing them down to remember, looking at me with wide eyes and a slight smile. She asked where I’d read that, and I said I didn’t think I’d read the particular phrase anywhere; I just said the words because they made sense, because I felt them, because it was in my heart. It sounds very beautiful: I said the words that were in my heart. That’s what makes me special, isn’t it? That I have this way with language. I spin letters like the fairy tales spoke of spinning straw into gold. But on my short drive home tonight, I mulled the words over in my head, and my pride slipped away a bit. 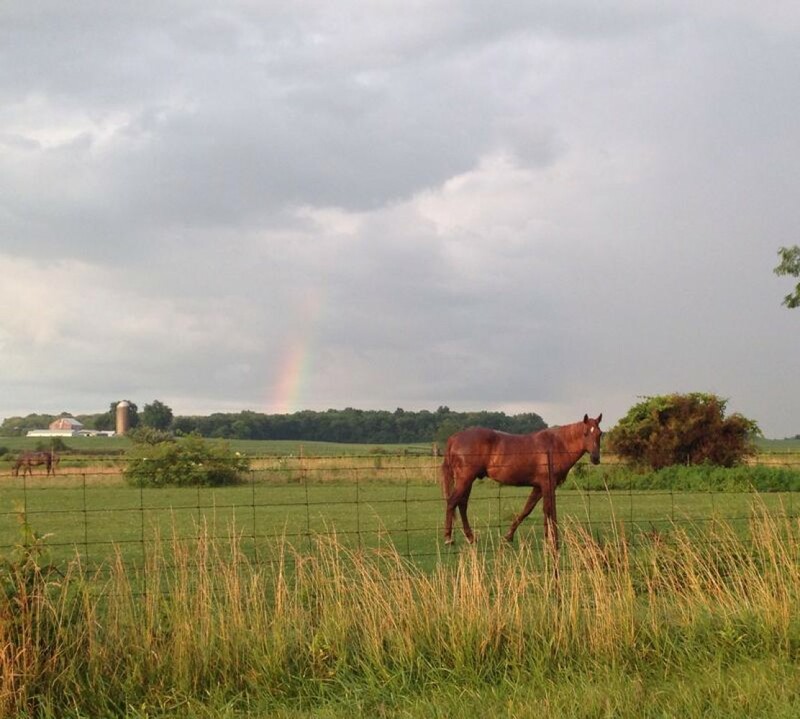 I believe those words – big life to be had – but maybe I don’t always live like it. I have an anxious heart – a big, open, hopeful, loving, joyful, trembling, giggling heart, but an anxious one, too. I know this about myself. Last semester’s moments of panic and sleeplessness confirmed it. The fact that it is difficult for me to get into cars with drivers who aren’t myself. The fact that sometimes, I hurt the people I love most because I think I need to be in control. It is indeed a big life to be had, but often my fear gets in the way, and I hate that. Because I know in the deepest chamber of my heart that I was not created to be afraid. This summer has been one of rediscovery. Finding again that girl in that heart chamber who runs barefoot through forests and cities and deserts. I didn’t venture far: I stayed in my college town, lived with a lovely professor, and worked on campus. I scaled no mountains, but I did road trip to the Pennsylvanian Appalachians. I went to four weddings, visited my boyfriend’s family, went home a few times, watched my sister graduate high school, buried my grandfather’s ashes, saw the destruction of a tornado, ate dinners on the deck, read many books, watched many movies, took a yoga class, babysat tinies, went to Florida, flew alone for the first time, wore more dresses than I did shorts, stayed up very late, held hands, saw three shooting stars, went on countless nighttime walks, and felt like it all meant something. My best friend lived minutes away and so we could celebrate our 8- and 9- and 10- and 11-month anniversaries together. 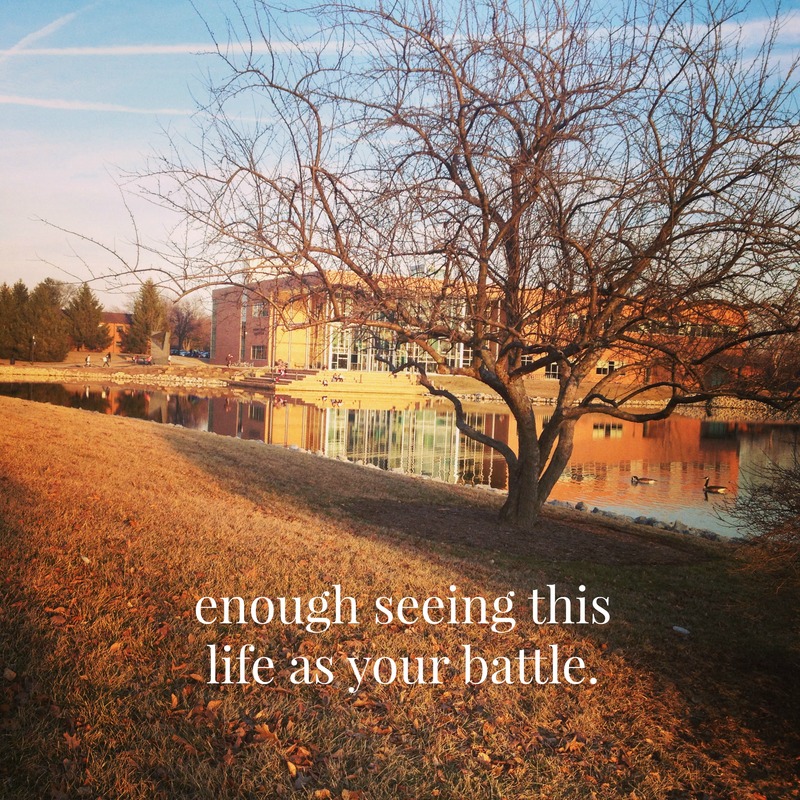 The depth of the fear I had felt the previous semester began to dry up, and though I slipped many times back into the leftover muck, I started to find myself again. And my goodness – my self is complicated. All selves are, I am convinced. I shift so easily from joy to self-pity. My temper flares suddenly and dies out slowly. Sometimes I can’t stop speaking. Other times, I can barely stutter my way through a thought. 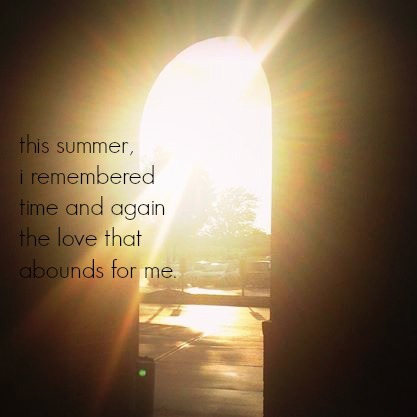 This summer, I remembered time and again the love that abounds for me. Love from the Maker, yes, He who molded and bought me, He who wins me over no matter how often I drift. This love drenches and soothes, and I have felt it so clearly at so many moments these past few months. But love from others, as well. From the family that does not try to hold me back or call me home, but instead lets me grow elsewhere, and always answers the phone. From the friends with the front door that I do not have to knock on before entering. From the yoga teacher who looked me in the eye and told me that my strength had nothing to do with my size, but instead everything to do with the love I poured into the earth and the people around me. From the young man who keeps walking beside me. From the children with eyes that light up when they see me. From the small, noisy little dog who cries and licks and runs to me when I come home for a visit. Love. It is all love. Find it, again and again and again. So maybe the words I spoke were truer than even I realized. Big life – big life full of love and road trips and going to the office. Life with the people who make it big. Stay in the small town when all the kids go home, and find again the community that surrounds those who remain. The secret, it seems, is not to find arrogant pride in the big life, nor is it to believe the lie that the fear defines you and steals the big life away. The secret, if it was ever a secret at all, is to find the life you have, over and over again, and see how big it must be to hold all the love poured in. It is a big life to be had, dear heart.